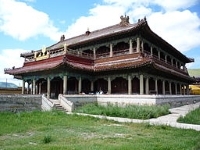 The Amarbayasgalant Monastery (the 'Monastery of Tranquil Felicity') is one of the few Buddhist temple complexes in Mongolia that wasn't completely destroyed by the Soviets in 1937. Located in Mongolia's northern province of Silenge, the monastery is situated in a beautiful and unusually fertile valley, in the shadows of the sheer cliffs of Mount Burenkhan. The monastery itself was built between 1727 and 1736 and conforms to a Chinese style of architecture characterised by intricate symmetrical patterns. It is surrounded by wild plains and cherry groves and, most interestingly, scattered among the cherry trees are Turkic-era graves of various geometric shapes, dating back to the 3rd century.